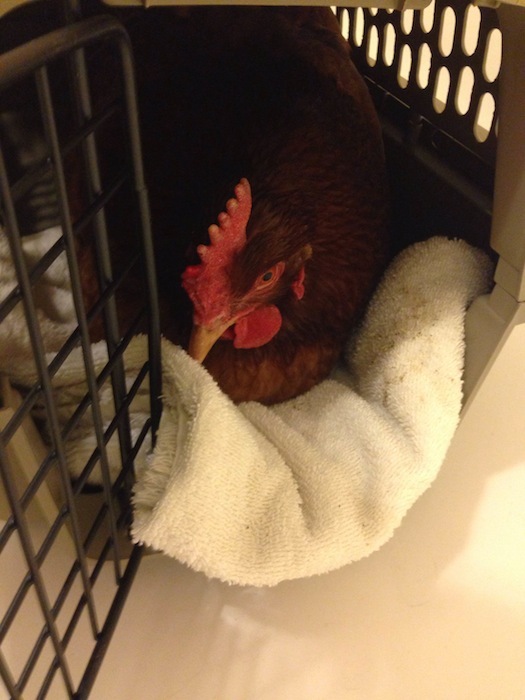 We can add “Give a chicken first aid” to the list of “Things I Never Thought I’d Do” but really, when you think about it, I should have known better when I signed up for this chicken-keeping adventure. 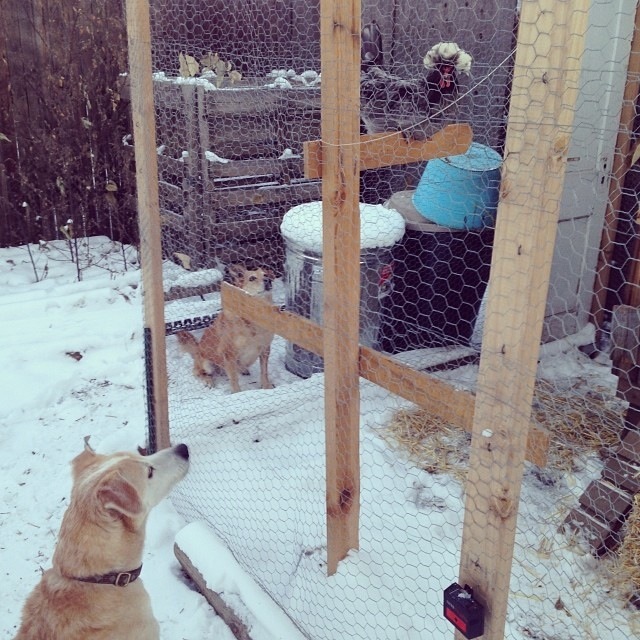 After years of looking after a friend’s flock—sometimes for days or weeks on end—I thought I knew all that there was to know about backyard chickens. That’s like saying babysitting prepares you fully for parenthood. HA! 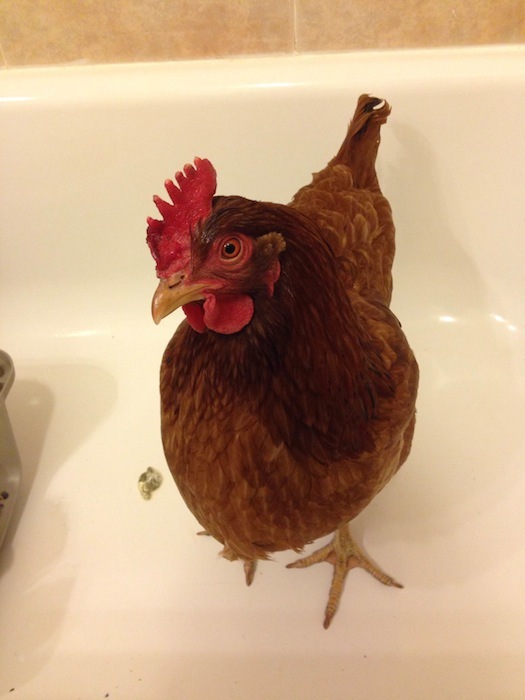 Mae is a Rhode Island Red, a classic chicken-looking chicken who lays an egg faithfully every day. 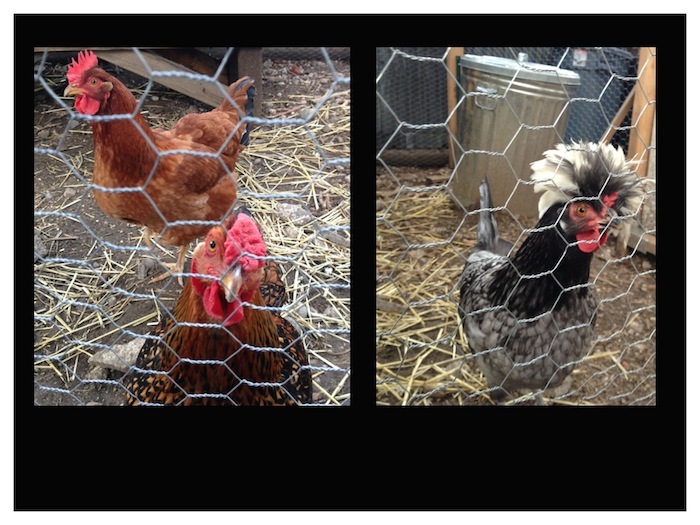 (This is more than I can say for her two lazier coop companions.) Last month, during a crazy cold-snap of single digit and negative temps, the tips of her beautiful comb turned black with frostbite. Happily, slathering her head with Neosporin and Vaseline got us through the rest of the deep freeze without further incident and now, a month later, her comb looks back to normal. Or at least it did…Which brings us to yesterday’s adventure. When I first saw the blood I thought it was paint. It was just too red. It wasn’t dark enough, brown enough, blood-looking enough. But it was blood all right. Right on her newly healed beautiful comb. The cold and the dry Denver climate just cracked the skin right open, just as it will do to the skin on the most rugged or delicate of human hands. Weather is egalitarian like that. I opened the door to the house and called in to the BF, “We’ve got a bleeder!” and we hastily put together the cat carrier we’ve bought for chicken veterinary purposes and set up a makeshift hospital in the bathroom. Towel, check. Warm water, check. Neosporin, check. Vaseline, check. 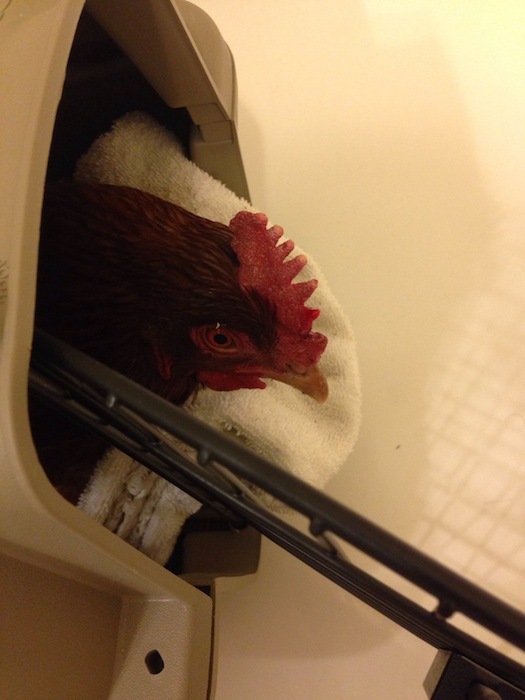 Step 1: Get the chicken in the kennel and get the bird inside. Step 2: Get the chicken out the kennel. See that red gash toward the front of her comb? The area that’s a lot more red than the rest of the comb? That’s the bloody part. Step 3: Wrap her body in a towel, with her wings folded in and no flapping limbs or legs allowed. With your free hand, clean the bloody part with a washcloth, wetted with warm water. Add some Neosporin, carefully and delicately on the once bleeding part. Finally, coat the rest of the comb with Vaseline to help moisturize the dry skin and keep any new emergencies from springing up while the comb heals. Viola. Chicken first aid! Mae was a trooper the whole time, calm and patient and not too stressed out. You’ll notice in the picture below she was even polite enough to wait until she was back in the tub before leaving behind a poopy present. Within 15 minutes she was back outside, ready to boss her flock around again. Chicken first aid, chickens, leah charney. Bookmark the permalink. Post a comment or leave a trackback: Trackback URL.